Back in 1970 Denny O'Neil and Neal Adams returned Batman to his "roots" as a "creature of the night". For unknown reasons (poor sales?) Julie Schwartz put this creative team on Green Lantern. 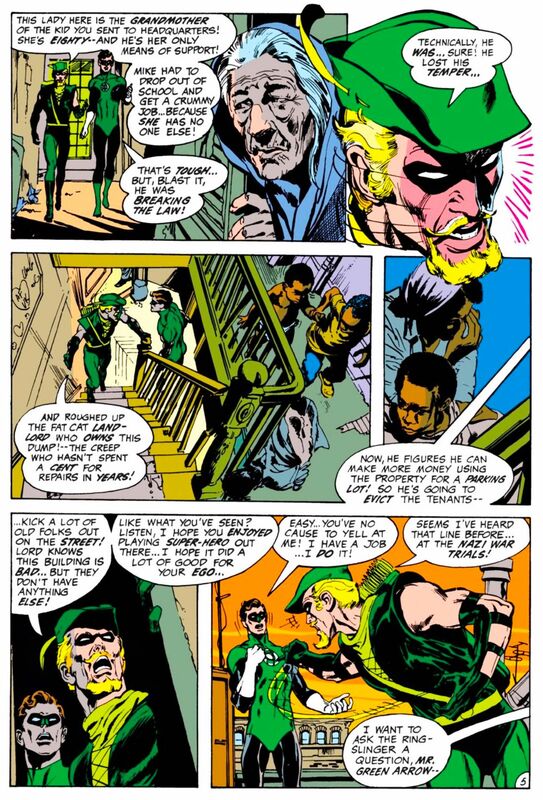 Denny brought in Green Arrow as his "voice" to write about how he felt about social issues at that time. Back then DC was old fashioned and it's readers were mostly kids. Marvel was challenging them sales wise and was appealing to college students as well. From #76-89 O'Neil and Adams brought "relevance" to comics and created (at that time) a groundbreaking run. In re-reading it the art is still beautiful to look at but the writing is dated. It is a product of that time and as such loses something when read today. Some of the ideas and attitudes have changed and unfortunately some have not changed. However I feel it bears looking at today as we still deal with some of the same issues today. Racism. Drug abuse. Depletion of natural resources. Written by Denny O'Neil. Art by Neal Adams. First issue. Sort of a set up issue for the "new" direction. Deals with questioning authority and slumlords. First of all this takes place after Ollie has lost his fortune. He also has his "new" look. GL comes across a white man being roughed up and intervenes. However GA is there and points out appearances are deceiving. The man is slumlord Jubal Slade who wants to evict his tenants from the tenement he owns. All to make a hefty profit by selling it. Once GL is confronted by one of the tenants he confronts Slade. However since Slade has broken no laws the Guardians intervene and reprimand GL. Later GL goes against the Guardian's edict and helps GA get enough evidence against Slade to have him arrested. The Guardians attempt to discipline GL for his disobedience but GA argues on his behalf. In response one of them goes with GL and GA across America to see first hand the social injustice GA talks about that the Guardians don't see. It is a classic that has been "copied" so many times. Issues that were "relevant" back in 1970 and I feel still relevant as we start 2019. We still deal with racism. And problems with authority. And even though it isn't talked about as much we all know slum lords still exist. The reason why it feels dated? Mostly dialog IMO. I still think viewed thru the lens of history it must have been a powerful and daring title at that time. I did not read it when it came out. I was only reading DC & Marvel's big guns (Superman, Batman, Spider-Man, Hulk) at that time. I finally read it 10-12 years later. I am curious what the rest of you think. Bwa-ha-ha-ha-ha! I kind of forget between times how awful that scene is. This comic did not age well at all. 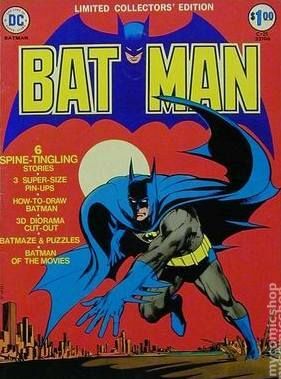 I can speak for the impact of GL/GA at the time in being a teen who bought this one fresh off the spinner rack. It was something special and amazing coming from a company that just did not have anything like this and it DID NOT come across as a Marvel riff. Marvel was doing their own thing connecting with the teens within the context of their comics being aimed primarily at them. This one book from DC took that aspect to another level because this suddenly went from being a kids comic book of super heroics with a touch of reality and turned it into something more like a true reality that all of us were seeing and living and dealing with daily. Yes, it was rather heavy handed in it's presentation but it was damn daring and a big wake up call. And it would likely have never gone over as big as it did without Neal Adam's artwork as the highlight and big selling point. Neal's "realistic" style took this one from silly children's comic straight into cult fan favorite of the older kids in the neighborhood. I was always the odd one out because I read comic books. But when GL/GA came out suddenly all of my cousins and other kids in school started to understand why I liked my comics so much. I remember only having a few of the issues during this run but boy did they get a lot of travel time from my hands to friends and family as well. Suddenly DC stood for DYNAMIC COMICS for this one series spoke to the general public and youth in a way that Marvel had yet to drive towards. Spider-Man was teenage soap opera for the most part but after DC had O'Neill and Adams Green Lantern and Green Arrow I imagine Stan felt the need to try and top them or up the anty as more adult stories began to appear in Spidey about the death of Captain Stacy, prison riots, Vietnam and drugs. This is one of my favorite series of all time. I don't see anything wrong with the " Black skins " line. To me it simply meant that he never involved himself with social urban issues. But really, what could he do ? it's something for lawyers to fight. Dude saved the world a dozen times over for the black skins, the white skins, the yellow skins, the red skins and the sky-blue pink skins. His hangdog expression and the look of defeat and despair at an angry old man is ridiculous. I loved this run when I was younger. But looking at it after I grew up it doesn't hold together well at all. And that scene is ludicrous. Being more of a "subtext" guy, I was never a big fan of these books. I get why it felt important at the time, but reads really forced now. Out of context and nearly 50 years later doesn't make the scene ludicrous. It was and is very much a part of the time and place of when it was created and printed. There was still segregation going around schools, there was still deep south racial tension occurring across the country and even then, me an 8 year old white boy in 1970 who grew up in and lived in several of the poorest parts of town where cultural mixes were "normal" as the poor and the outsiders were thrown together wherever they could afford or find outside of the city limits lived; I saw the racial bigotry still going on around me. I knew and lived around/playing with the Hispanic, Chinese, Italian, Jewish, Korean and Black families of my neighborhood(s) and whenever I came into "the city" it was shocking to find that what I knew as "normal" was considered "abnormal" by many. I truly had a Hispanic and Black best friends that were like part of my family and there were times when both of them traveled with me and my family into the city and we the "white" family were told we couldn't shop or eat there since we had "others" who weren't acceptable. It all depended on what "part" of town you were visiting and what "part" of town you were from. It even went so far as to local churches around town. My family left several churches for just such bigotry and racism. 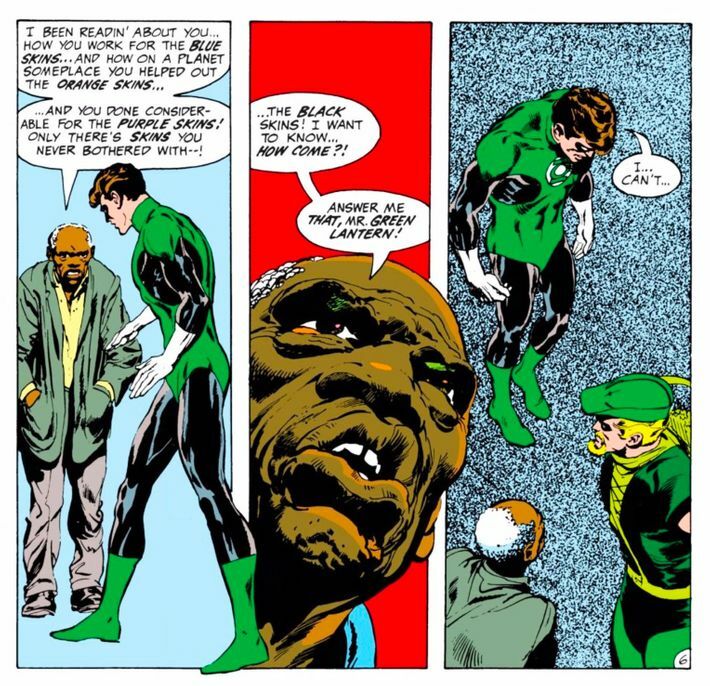 The white upper class skilled fighter pilot Green Lantern being confronted by an old poor black man that he likely never ever l would look twice at if he would pass him on the street was a reality of the early 70's. Lots of people were being shown and awakening to the social/racial improprieties that wealth and title seemed to separate the classes. It was my Freshman year into High School when they stopped the segregation at most of the cities here in the more upscale neighborhoods and they began to literally bus in other ethnic students in to other schools in the "rich or well to do" parts of town. I'm fully aware of the context both within comics and the fact that segregation in the American landscape at the time. I've spent a ton of time studying the social and economic situation that led to the landmark cases of Brown v. Board of Education, Gideon v. Wainwright, Loving v. Virginia, etc. I've done fairly extensive studies of the history of lynchings of Hispanics and Filipinos in the U.S.
None of that changes the fact that this book was ridiculously heavy-handed and that Green Lantern's response doesn't remotely ring true...particularly given his status as a "white upper class skilled fighter pilot." The book may have been a landmark. It still remains overwrought and I don't buy GL acting in that manner. For what it's worth the "drug issues" of Spider-man are pretty bad too. I suspect that I'd feel the same about most "relevant" super-hero funnybooks on a re-read. I think the scene works pretty well as self-aware metaphor. "Why are comic books/adventure stories in our culture about only one thing? Why are they so segregated? Why don't they reflect the real world more?" I think the scene works pretty well as self-aware metaphor. It was a critique of the industry and genre as a whole, not really of Hal Jordan. He merely represented the institution and, as he had a title no one was reading anyway, why not give Adams and O'Neil the space to do it there? I think that's they key. One can read it that way. And if you do that’s fine. I see no indication that O’Neil was enough of a writer to do something that symbolic or metatextual. Not that one can’t read in more than the author actually wrote. I can't speak for O'Neil, but this is right up Adams' alley. I spent some time exploring the beginnings of his quest for racial representation in DC comics with my review/analysis of Teen Titans #20. He continued that battle into his Green Lantern/Green Arrow run and seems to believe it culminated with the introduction of John Stewart. O'Neil was certainly passionate about championing causes as well, but Adams was thinking big picture racial representation long before this issue saw print. The comic is heavy handed; but, I think most stories that attempted to address real world concerns had a tendency to be heavy handed, whether comic books, message films (like China Syndrome), tv episodes (like MASH, in later years, or Quincy) or comic books. Comics especially suffer as it is not a subtle medium. Well, the superhero genre, anyway. The problem is not so much the heavy handed way O'Neil voiced things; but, the fact that there is no real debate of the issues. GL ends up being a punching bag, without ever getting to make counter-arguments with a different viewpoint. 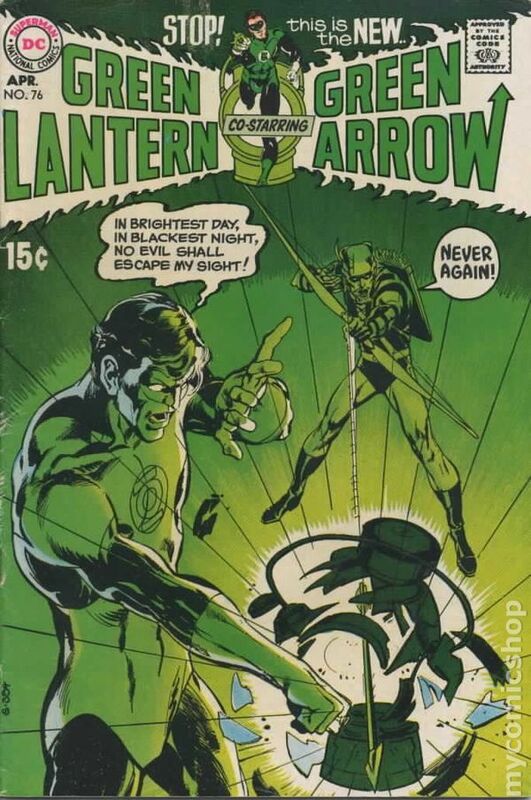 Ollie was always right and righteous and Hal always had to be brought to the truth. It was rather like Crossfire and Hannity & Colmes, where it is really just a one sided fight, with the other guy there merely to be taken down by the architect of the show (Pat Buchanan and Sean Hannity). The other side never gets to voice a real counter-argument because they have been booked to lose the argument. They are what a "jobber" is in pro wrestling; the guy on tv who loses to make the star look good. Green Arrow is the crusading rebel, like the youth fighting the Establishment. GL was the cop, the symbol of the Establishment. Hal was rarely given a chance to voice anything from his vast and wider experience and maturity, than Ollie, who had been a spoiled rich boy, before finding his cause(s). Hal had been a military officer, test pilot, and intergalactic police officer. he had travelled the globe, the galaxy and time, while Ollie checked his stock prices. That never got brought up, because O'Neil was voicing his much younger point of view. Go 20 years down the road and have him do the same thing and it is much different. I also don't think he was as comfortable with a character like Hal, whose power is potentially limitless. He was more at home in dealing with mortals; mortals with gimmicks; but, still mortals.